First of all, no double posts.. Please read the rules.. Oh and.. Welcome to GT! lordt0m wrote: And are there any KotOR and Yuuzhan Vong sides? And i can see here only the units of the clones, and the CIS. No GCW? Only a CW era? Yay! That'd be my favorite era of all time!! Yup, we had a discussion about that, but finally agreed not to do it. I had the sides ready to be used though, with new models and stuff! How come you didn't decide to do a Vong era? That would be wicked awesome! After you finish this mod, you should really consider about doing a Vong era. I bet you guys could pull it off! Hey, I also got a question... will there be Captain Rex with his dual pistols in this pack?? IF MandeRek decides to do it and IF we have time. Don't get your hopes up. I'm sure he'll see about it.. In my opinion I like the GCW better than the Vong era. NullCommando wrote: I'm sure he'll see about it..
Uhhh... isn't it "he'll think" about it? NullCommando wrote: IF MandeRek, Wazmol and FOOLIS decide to do it and IF we have time. Don't get your hopes up. I'm sure they'll see about it..
Once I figure out modding, I think I'll work on a mod with the Vong in it. I think somebody started one but now it's dead. 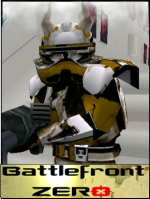 Anyways, before we get off topic, Battlefront 0 is definitely going to be one of the best mods out there. I bet it will be just as good as the convo pack! Do you think we might be able to get a tentative list of what heroes will be on which maps? k'kruhk wrote: Do you think we might be able to get a tentative list of what heroes will be on which maps? You know, it's too bad Jango Fett died at the beginning of the Clone Wars... why'd Mace have to chop off his head?? He was only a Bounty Hunter (and the coolest), he could have been changed to good if Mace didn't slaughter him. Will his ship, the Slave I be included in any maps?? Will it also have the Jedi Starfighter as seen in the Clone Wars series?? Nova Hawk wrote: You know, it's too bad Jango Fett died at the beginning of the Clone Wars... why'd Mace have to chop off his head?? He was only a Bounty Hunter (and the coolest), he could have been changed to good if Mace didn't slaughter him. Any hints of the Sith Infiltrator?? Listen, i'm not gonna answer 200 is this gonna be in or that questions.. Check all info topics, if it's in, it will be there..